This product requires the base game The Bureau: XCOM Declassified. © 2008-2013 Take-Two Interactive Software, Inc. Developed by 2K Marin. XCOM, The Bureau: XCOM Declassified, 2K Marin, 2K Games, Take-Two Interactive Software and their respective logos are all trademarks of Take-Two Interactive Software, Inc. All rights reserved. All other trademarks are property of their respective owners. 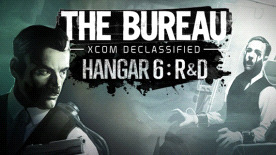 The Bureau: XCOM Declassified is required to play this DLC.